Inviting classic Myers Park style mixes timeless architectural appeal with artistically tasteful decor and accents, all working in concert to create a "must see" experience. Dine al fresco on the large terrace in the privacy of a hedged and walled compound, or relax with a good read in one of the numerous impeccably stylish yet cozy living spaces. Fully updated in 2007 with new electrical and plumbing infrastructure, main level Sonos sound system, and fantastic gallery type spaces to add your own accent pieces. This home's four bedrooms are enhanced by a separate carriage house living quarters above the spacious 3 car garage. 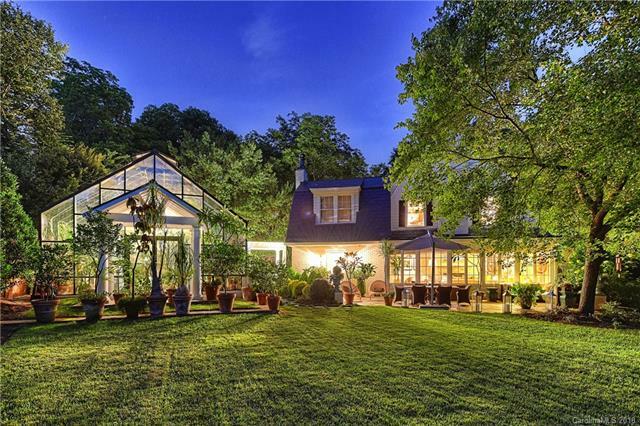 Relax with nature in the 770 sf climate controlled greenhouse adjacent the gated motor court.